Emotionally powerful story centers around the daily life a poor, struggling, but loving, 19th century Welch Morgan family in a simple mining village as told through the eyes of a grown man who was a young boy. John Ford (who also won the Oscar for direction). The most honored director, with four Oscars: THE INFORMER, THE GRAPES OF WRATH, HOW GREEN WAS MY VALLEY, and THE QUIET MAN. With Roddy McDowell, Anna Lee, Barry Fitzgerald, Patrick Knowles, Arthur Shields, and John Loder. Darryl F. Zanuck (1902-1979), produced three films that won the Best Picture Oscar: HOW GREEN WAS MY VALLEY (41), GENTLEMAN'S AGREEMENT (47), and ALL ABOUT EVE (50). He started as a writer in the twenties, and then became Production Chief for Warners Brothers in 1931, then in 1933 he co-founded 20th Century, which merged with Fox in 1935. He was Production VP of 20th Century-Fox from 1935 to 1952, and then he became an independent producer. In 1962 he returned as executive president. Darryl F. Zanuck is considered by some as Hollywood's most efficient mogul. His other works include: IN OLD CHICAGO, DRUMS ALONG THE MOHAWK, THE GRAPES OF WRATH, TWELVE O'CLOCK HIGH, VIVA ZAPATA, ISLAND IN THE SUN, and THE LONGEST DAY. Richard Day and Nathan Juran; Thomas Little for best B&W Art Direction. 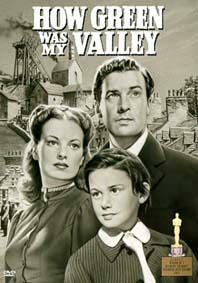 While Arthur Miller won for best B&W Cinematography. Based on the best seller by Richard Llewellyn.